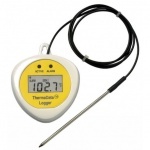 Data loggers - ThermaData® logger TD1F with internal & external fixed sensor. The TD1F ThermaData® data logger incorporates both an internal and external NTC thermistor probe with a one metre PVC/PFA lead that measures over the range of -30 to 85 °C (internal)and -40 to 125 °C (external) and can record up to 2 x 2000 readings. The ThermaData® logger TD1F data logger is housed in a waterproof, ergonomic case that is designed to meet IP66/67 protection. Each TD1F logger incorporates a red and green LED and 10mm LCD. Please note: when ordering loggers it is necessary to order at least one ThermaData® logger cradle as this will also have the software Which is not MAC compatable.